With Moodle 3, there is a new "default" in the way hidden grades affect the Totals columns in student views of the Gradebook. *either selection will show the Total Grade to students. Same options, and same settings to change...this one is specific to the User Report, so also needs to be set! a. you've invested alot of time entering grades, and don't want to re-invest! This will download your current gradebook to your computer's download folder. Typically you don't need to do anything more with it, but you can move the file someplace (like your documents) and have it avaiable just in case something unscrupulous happens to your GradeBook! 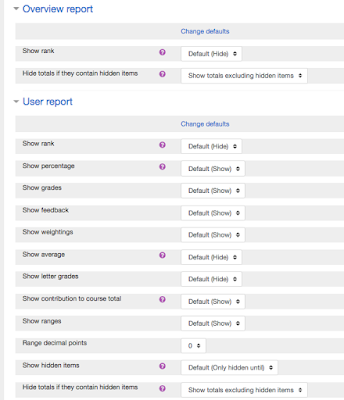 Groups in Moodle are useful because they can be used to filter activities from certain groups within your class. Groups can be troublesome because they can be used to filter activities from certain groups within your class - when you don't wish to!!! With Editing On, you can 1-Click change these settings. I have discovered several situations where this was done inadvertently! If students are having issues accessing and/or posting to certain activities, please check this icon. You are a teacher in a course where you have several classes and you want to filter your activities and gradebook so you only see one class at a time. You are a teacher sharing a course with other teachers and you want to filter your activities and gradebook so you don’t see the students from your colleagues’ classes. You want to allocate a particular activity, resource or topic section to just one class or set of users and you don’t want others to see it. This screencast about using groups also highlights the benefits of using groups. Why can groups be a bad thing? Well, they really aren't, however you do need to pay attention to what it means to be in a group. You don't want to be "filtered out" of any activity, if you really need it! Change Group Mode to "No Groups" and Force group mode: Yes, means All students will be able to see, post, etc. This is the most common setting, unless you actually choose to use groups and filters. By Forcing this change, it will apply to any current forums/activities already in place.